These are called ol’ lady bars because I made them for a sewing get together with a group of ladies that are almost all at least thirty years older than me. I use the term ol’ here in a rockin’ way. These ladies are impressively sassy and energetic for their age… and quite crafty. Plus, they have the stamina to sew for six hours straight- until midnight! That’s pretty rad, if you ask me. Anyhow, this recipe seemed a little old fashioned to me because it is toffee-ish, but doesn’t have any toffee candy in it. 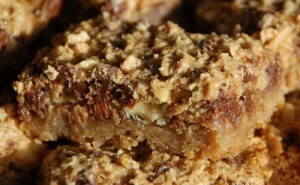 It is based on America’s Test Kitchen’s “Coconut Toffee Chew Bars” recipe. They are excellently chewy and have great coconut flavor. The chocolate is a nice addition, but definitely does not dominate. I cut these small and got 24 small squares. And they kept the sewers sewin’ into the wee hours! Grease a 9 inch square baking pan, set aside. 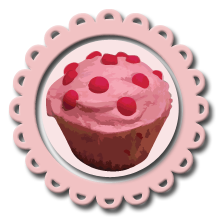 Beat the butter, sugar, and salt together with an electric mixer on medium speed until light and fluffy. Beat in the flour on low speed until combined. Sprinkle the dough into the prepared pan and press into an even layer. Bake for 15 minutes or until crust is golden brown. Toast the coconut and the almonds in the oven for 5-15 minutes, turning and checking every few minutes, set aside to cool. Whisk together the flour, baking soda, and salt in a small bowl, set aside. Whisk the egg, sugar and vanilla together in a medium bowl. Whisk the flour mixture into the egg mixture until combined. Stir in the coconut, almonds, and chocolate chips. Bake until lightly browned around the edges, about 20-25 minutes. Allow to cool in the pan at least one hour before cutting and serving. This entry was posted on Sunday, March 22nd, 2009 at 9:15 pm	and is filed under Bars. You can follow any responses to this entry through the RSS 2.0 feed. You can leave a response, or trackback from your own site.